Smashbox Fade to Black Autumn 2013 collection, lots of photos and swatches! You know you love a make up collection when you wait for the perfect opportunity to photograph it. Over the weekend, I finally got organised enough to take millions of photos and had good enough lighting to swatch the products too. Only a beauty blogger will get that! Anyway, the autumn collection from Smashbox called Fade to Black is beautiful. I spoke about it in more detail in my first look post, so I won't waffle too much. You're here to see the photos! First up, the packaging. I love it and the palettes and lipsticks follow the fade to black theme with the vivid pink fading to black. I'm a sucker for cute packaging, what can I say. 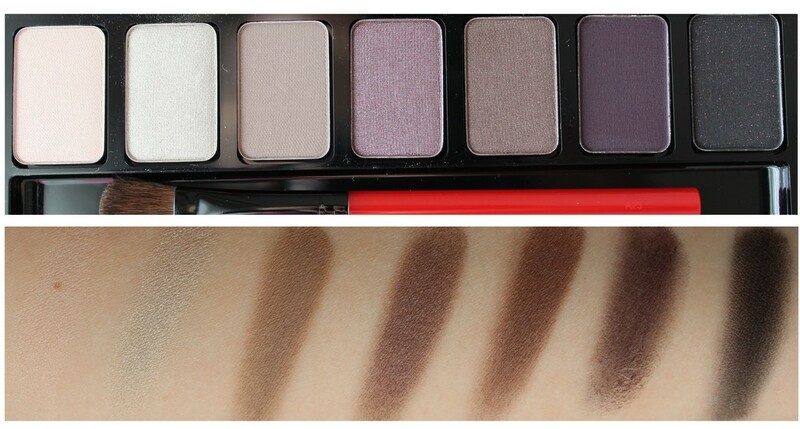 The first palette is Fade Out and the shadows start with a really light peach shade and ends up with an almost black shade, with varying hues of purple in between. There's a grand big mirror for you to get busy with and a really decent fluffy blending brush. Like any other Smashbox shadows I've tried, these are soft, blendable and pigmented. The darkest shade looks nearly black and you can't see the shimmer too much, but applied over a black base, the shimmer shows up a lot more. 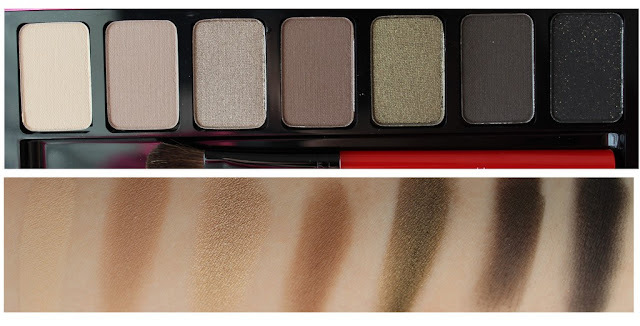 Each of the shades seem to have a warm undertone to them which means that the palette isn't just targeted towards those of us with green eyes. The three middle shades are my favourites and I know I'll be getting good use out of Fade Out over the autumn months. Fade In is a neutral palette where shades start at a creamy matte shade and ends up at a black shade with gold glitter. Again, the black shade fares better over a base to give the glitter something to stick to. My absolute favourite shade of the palette is the greeny gold shade that's third from the right. It's stunning and I need to find out if I can buy it on it's own. The matte shades are creamy and pigmented and I think this is going to be me every day palette for the foreseeable future. Bootiful! There are two lipsticks in the collection, Cognac and Black Cherry. When I first clapped eyes on them, I thought Black Cherry would be too dark on, but when I saw it in action, it was love. And after playing with the two shades at home, Black Cherry is my favourite! Cognac is a warm caramel colour that's really flattering on, especially in the sun we're having. 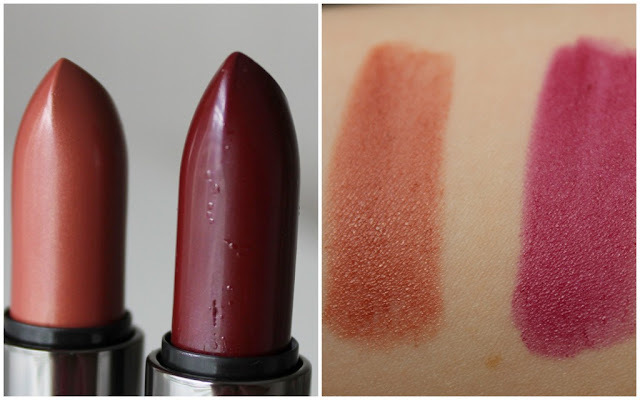 Black Cherry is autumn in lipstick form for me. If vampy lips are too scary for you, then something a bit lighter like this one will work perfectly for you. Each of these lipsticks feel moisturising on the lips and pack a punch in terms of colour. 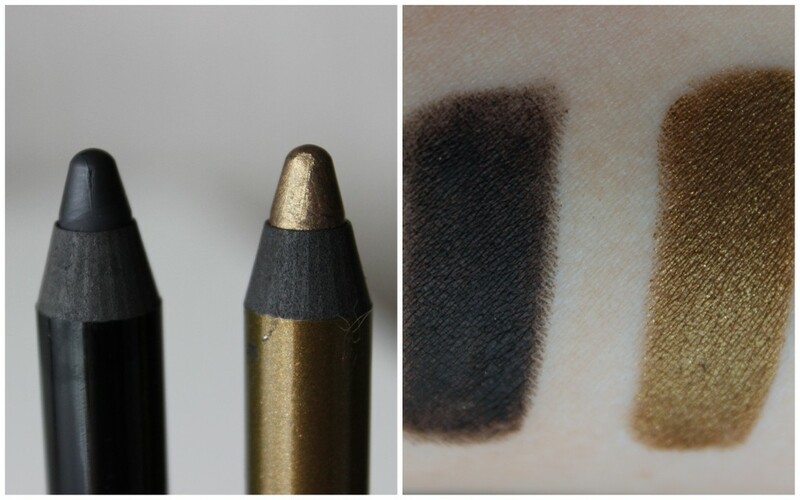 Finally we have two shades of the Waterproof Shadow Liners. Blackest Black is just that and Black Gold is the star of the show in my opinion! It's an antique gold shade with almost olive undertones to it. I blahddy love it. These guys set quickly and do not budge whatsoever. I'd advise you to work on one eye at at time with these shadow liners and if you're going away on holidays, then they're worth checking out because they won't slip a bit in the heat and are waterproof too. As I'm typing this, I've got Black Gold all over my lids and I'm obsessed. Have been for weeks! You'll be able to pick these up at Smashbox counters from the end of August and stay tuned for some make up looks and tutorials with these beauties! Anything tickle your pickle here? Damn it! damn it! damn it!! I want both those palettes now. Wow, these products look amazing and extremely pigmented too! Want that gold eyeliner! Oh god this stuff is so pretty, I don't own much Smashbox stuff I might have to invest! I want all of this!!! Oooh, that Black Gold pencil will be MINE!!! !